Narrator: Fisherman have quite an effect on our undersea friends. Squidward: SpongeBob, have you finished swabbing the deck? Mr. Krabs: (comes running through the front doors) They're back! They're back I tell ya! I saw it with my own eyes. (everyone looks at Mr. Krabs like he's crazy) The hooks. The hooks. Customer #1: How about a mint? Mr. Krabs: The hooks. The hooks. Customer #2: Can you make that to go? Squidward: You don't know how lucky you are. Squidward: I'd love to hear one of your riveting sea tales, but I have to do my waste basket inspection. (puts a trash-can on his head) Uh-huh. Mm-hmm. Oh, yeah. There's one. Mr. Krabs: Fine, but don't say I didn't warn ya. SpongeBob: Warn 'em about what, Mr. Krabs? Mr. Krabs: The hooks, me bucko. They're back. Beware the hooks. SpongeBob: (gasps) What could be worse than that? SpongeBob: (hides under a box) Don't let 'em get me, Mr. Krabs. Mr. Krabs: There, there, boy. They won't get ya. Not as long as you listen to ol' Mr. Krabs. Now get back to the kitchen. Time is money. SpongeBob: Aye, aye, Mr. Krabs. Patrick: (pokes his head through one of the kitchen windows) Good morning, Krusty Krew. Patrick: Guess what? The carnival's in town. C'mon, let's go. SpongeBob: I can't leave now. I'm working. Patrick: It's not leaving. It's just taking a break. (SpongeBob goes outside beind unseen) We're going to the carnival. We're going to the carni...(trips and falls on face) We're going to the carnival. We're going to the carnival. There it is, SpongeBob. The carnival is back in town. (many hooks are dangling) I'm gonna be first in line for everything! Patrick: I don’t know. There was one kid here, earlier. SpongeBob: Doesn't look like any carnival I ever...(bumps into a hook) Excuse me. (gasps) Stop Patrick! Don't touch it! This isn't the carnival, Patrick. Those are hooks. Mr. Krabs said they were really dangerous. Patrick: (sits on a hook) Hmmm. I sense no danger here. How can they be dangerous? They're covered with free cheese! Patrick: Cheesy. No danger here. Go on, try it. Patrick: SpongeBob, let me ask you something. (puts 9 hooks in his mouth and still has 1 in his hand) Does this look dangerous? SpongeBob: (gasps) Patrick! Help! Oh, Patrick, help! Oh, Patrick, come back. Oh, my best friend. (Patrick floats down and SpongeBob runs into him as he hits the ground) Patrick, you're alive. Patrick: Am I ever. You should try it. SpongeBob: But...what about the surface, and your britches, and the gift shops. Patrick: You just jump off before you get too high. SpongeBob: Mr. Krabs said I shouldn't get near those things. Patrick: Did he say you shouldn't climb on top of them and ride them like a horsey. Customer #1: P.U., you call this food? Customer #2: My sandwich taste like a fried boot. Customer #3: My sandwich is a fried boot. Squidward: Why do you wanna eat this stuff, anyway? Mr. Krabs: Mr. Squidward, what the halibut is going on in here? Squidward: It's a feeding frenzy, sir. And SpongeBob's not back from his break. (Mr. Krabs laughs) What? Mr. Krabs: I thought you said SpongeBob was taking a break. No one's taking a break at the Krusty Krab since the Chum Famine of '59. (laughs) Now, what were you saying? 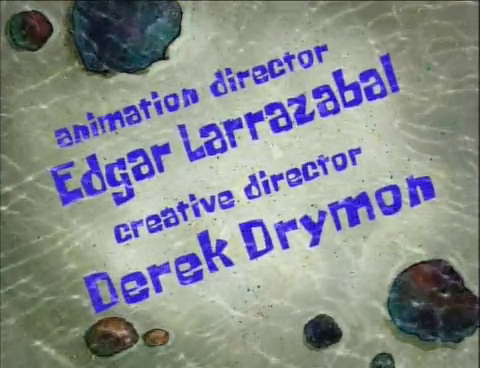 Squidward: He took a break. Mr. Krabs: Alright, SpongeBob LazyPants, I'll find ya. This nose can smell laziness up to 10,000 leagues. (uses his nose to smell) Aha! I'll give you a break you'll not soon forget. Mr. Krabs: The hooks! No! No! No! Mr. Krabs: Boys. I wasn't quick enough. They're gone! If I can only hold them in me arms again, I'd...I'd... (SpongeBob & Patrick float back down while laughing)...I'd throttle 'em. What did I tell you about those hooks, boy? Patrick: I’ll tell you about the hooks. You ride 'em up, and up, and up, and gently flow down. Mr. Krabs: And do you know what happens when you don't float back down? SpongeBob & Patrick: We're sorry, Mr. Krabs. Mr. Krabs: I want you boys to promise me you'll never go on those hooks again. SpongeBob & Patrick: (raises hands) We promise Mr. Krabs. Mr. Krabs: I need a sailor's promise. Repeat after me: Yo-ho, yo-ho, near the hooks I'll never go. SpongeBob & Patrick: Yo-ho, yo-ho, near the hooks we'll never go. Mr. Krabs: Yow!! Mother of pearl. Fire on the poop deck. SpongeBob & Patrick: Ahh! Mother of pearl. Fire on the poop deck. Mr. Krabs: Whoa. Whew. Alright then. Let's get out of this death trap. SpongeBob: Okay, Gary. Today is a new day. I'm ready to prove myself loyal to Mr. Krabs. SpongeBob: I'm ready! (comes running out of house) I'm ready. I'm ready. I'm ready. I'm ready. I'm ready, ready, ready. I'm ready. Patrick: Hey, SpongeBob, you're going the wrong way. SpongeBob: I always go to work this way. Patrick: You're not going to work today. We're going to go play hooky! SpongeBob: But, Patrick, we promised. Patrick: Well I had my fingers crossed. SpongeBob: You don't have any fingers, Patrick. Patrick: Well that Mr. Krabs is just a big dummy. We played on those hooks all day long and nothing happened to us. Patrick: See ya later, SpongeBob. I'm going to go have some fun. (Patrick goes up and down the hooks) You know you want to. SpongeBob: Ooh, I know I want to, but I promised Mr. Krabs that I wouldn't go near another... (almost runs into a hook. Gasps) ...hook! (almost touches the hook but takes it back) Oh no! Mr. Krabs told me all about you. You are a liar. A deceiver. I'll never fall for your tricks again. Never! (goes back to hook) Is this seat taken? (hook takes him up but when he comes down and turns around, we are shown he is hooked at the pants) Whew. Glad I got that out of my system. (gasps) I'm...hooked. And that means... (shows can of tuna opening with SpongeBob's face in the can. SpongeBob screams) Help! I'm hooked! Help! Mr. Krabs! Help! It happened! I'm hooked! Oh, no! The hook! The hook! Gift shop, tuna can, mayonnaise! Mr. Krabs: Here you go, Pearl. Free water for all your little friends. Mr. Krabs: Just don't forget to leave a tip for ol' Mr. Krabs. Mr. Krabs: SpongeBob! You're two minutes late. What kept you, lade? SpongeBob: Um, you know those hooks we were talking about yesterday? Mr. Krabs: Didn't I tell you not to go near those hooks? SpongeBob: Umm...no. (hook pulls him a little closer) I mean yes, yes, you told me not to go near them. Mr. Krabs: Well, you weren't playing on those hooks, were you lade? SpongeBob: Of course not. (hook pulls him a little closer) I mean, not exactly. (hook pulls him a little closer) I mean, yes, yes I did it. I admit it. (cries) Oh, Mr. Krabs. I'm so ashamed. I mean, look at me. I'm hooked! Mr. Krabs: Hmmm, it's in there pretty deep. SpongeBob: What am I going to do? SpongeBob: Oh no, Mr. Krabs. I can't take off my pants. Not in front of all these girls. (hook pulls him closer) Doh, okay. I'm taking 'em off. I'm taking 'em off. (takes pants off) There. SpongeBob: Ahh! Oh no. Oh no, no, no, Mr. Krabs. I can't do it! Anything but that! Mr. Krabs: I understand. You were a good little fry cook, SpongeBob. (puts up Help Wanted sign on window/door. SpongeBob gasps) But, we'll find another. Hopefully one that will listen to ol' Mr. Krabs. Squidward: Well, that was more of SpongeBob than I needed to see. Patrick: (bus drops off a can of tuna) Hello? Does somebody have a can opener?